Our website has easy processes in place where after you add a product to the cart it will take you to the corresponding measurement profile page from the shopping cart where you can enter and create your measurement profile..
How to apply a measurement profile. 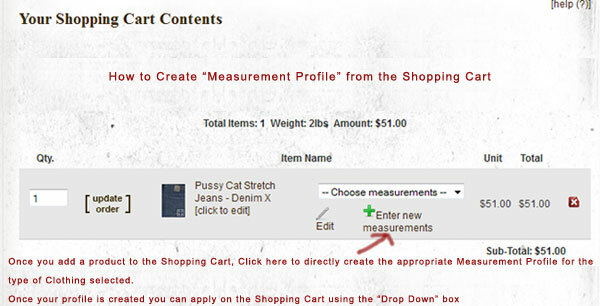 How to create a "Measurement Profile"
To submit measurements you need to create your "Measurement Profile" once and apply on the shopping cart to the clothing you have ordered. You can also tweak the measurements as and when required. You need to go to "My Measurements" a sub-link under "My Account" which is on top of our website. Once on the measurement page, you can click on the required field and see the pictures and instructions on the Left and Right hand side respectively. For basic Jeans there are 2 categories, one is "Custom Jeans" where all the denim available is of non-stretch material and the other category is that of "Stretch Jeans" , here all the denim fabrics have stretch properties. After ordering from the above pages you can choose the style of pockets from our "Add-On Pocket Style" page, this will give your jeans a designer look, if you do not choose an add-on pocket we will make with basic "5 Pocket Style" back pockets. We also have a "Women's Special" section where we provide styles as add-ons, check out the great styles and other options here. If you want jeans with pre-set patterns, we sell selected designs, you can order these from "Designer Jeans" category page. You can also opt for Emboridery or Ready Embroidered Patches and Ripps, have a look at our "Add-Ons" pages for more information. We recommend giving FIX i.e finished measurements for the Thighs and Knees for a more accurate results, you can measure an existing pair of jeans and enter accordingly. We give 2 back welt pockets and front cross pockets for trousers if you do not choose any pocket style. You can also have a look at "Cotton Stretch" category, this category has cotton fabrics with stretch materials. We recommend giving FIX i.e finished measurements for the Thighs and Knees for a more accurate results, you can measure an existing pair of pants and enter accordingly. If you are a repeat customer do read our link on "Repeat Orders" by clicking here.